The AFL yesterday released the audited 2017 numbers for all AFL clubs. 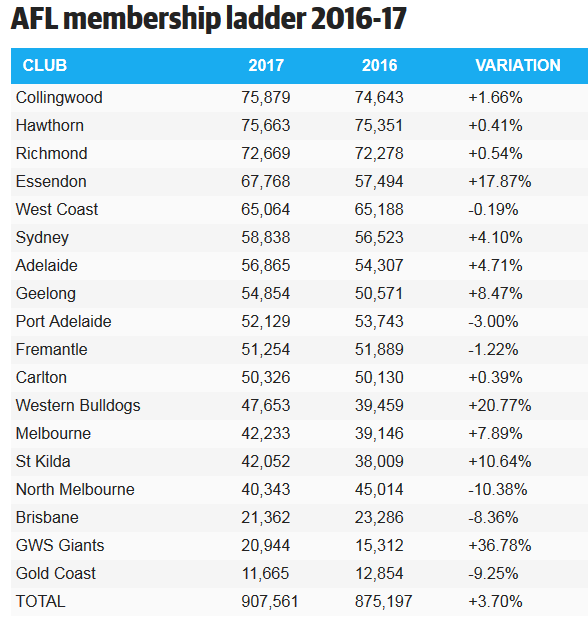 This years numbers included more than 7,000 AFLW members (although not all clubs, and not even all AFLW clubs had womens memberships), which comfortably puts the AFL membership tally at over 900,000. Forty-five per cent (3237 fans) of those AFLW people are new members to the AFL. This means that some clubs lose some part of the membership numbers they tout in their membership tallies. Adelaide and Port Adelaide are the most affected by this. According to Port Adelaide, the audit includes all membership products that meet certain criteria, applied consistently across the league’s 18 clubs, and Port’s share of the 8,000 Adelaide Oval stadium members based on a split of 28% being allocated to the club by the ground’s Stadium Management Authority.